By Dan Ambrose: Juan Manuel Marquez (56-7-1, 40 KOs) is targeting WBO welterweight champion Jeff Horn (17-0-1, 11 KOs) as someone he wants to fight in December. Marquez will be turning 44-years-old in August, and he hasn’t fought in 3 years since his 12-round decision win over Mike Alvarado in 2014. Marquez plans on making a comeback next month in August against a still to be determined opponent. 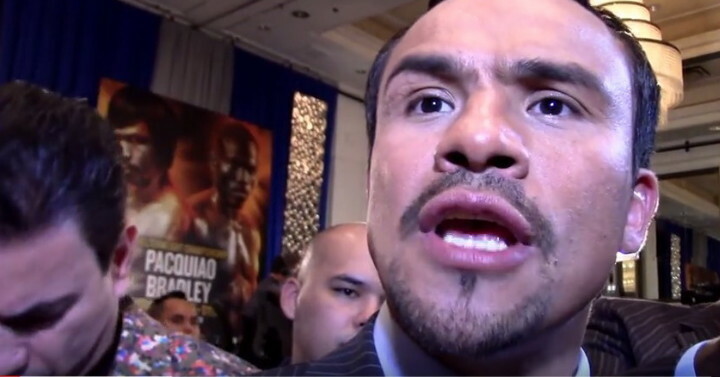 If successful in that fight, Marquez wants to fight either Horn or possibly Miguel Cotto in December. Horn is now the new money man for the welterweight division due to the intense interest in boxing in Australia. To get a big payday at welterweight, Horn is the guy to be fighting. There’s nobody else in the welterweight division that can bring in the boxing fans like Horn. Marquez is being shrewd at targeting Horn. He obviously sees that as the biggest payday available. It’s no longer Pacquiao or Floyd Mayweather. It’s Horn that is the money man now at 147. Cotto has a fight scheduled for August 26 against Yoshihiro Kamegai for the vacant WBO World junior middleweight title on HBO Boxing from the StubHub Center in Carson, California. If Marquez fights Cotto, he could potentially have a chance to win the WBO 154lb title. That would be Marquez 5th division world title that he’s won during his career. Horn, 5’9”, would have a huge height, reach and weight advantage over the 5’7” Marquez. The age difference between the two fighters would also be significant. Marquez is 14 years older than Horn. The just the age alone between the two fighters would make Horn look like a youngster inside the ring with the nearly 44-year-old Marquez. Marquez is a not a big fighter. He would likely rehydrate into the 150-pound range. Horn looked like he was close to 170 lbs. last Saturday night inside the ring against Pacquiao. If Marquez had to fight someone 20 pounds heavier than him in Horn, he would have virtually no chance of winning. If don’t know if that would be a concern or not for Marquez. Is he coming back for the money only or does he really think he could beat Horn or Cotto. I don’t think Marquez will be competitive with a fighter as big as Horn. Marquez has had a knee problem since his fight with Mike Alvarado in 2014. If the knee issue still exists, then Marquez is going to be hobbled inside the ring against Horn. You can bet that Horn will test Marquez’s problem knee by leaning on him with all his weight. If there’s an existing knee weakness with Marquez, Horn will expose almost immediately by leaning on him with all his weight. Horn is a huge fighter for the welterweight division. Marquez has never fought anyone as big as Horn. It would be a real size mismatch. Getting a fight against the suddenly popular 29-year-old Jeff Horn could be a tough reach for Marquez, as Horn could be facing Manny Pacquiao in a rematch this year around November or December. That’s when their mutual promoter Bob Arum would like the rematch to take place in Australia. If Pacquiao decides he prefers not to fight Horn again, it would still be difficult to imagine the Australian wanting to fight Marquez before the end of the year. Marquez was a popular five years ago, but he’s been inactive for the last three years. You argue Marquez is no longer relevant in the sport. He would be coming back to boxing for whatever reason. Some fans might suspect that Marquez is just looking for a big payday. Pacquiao made $10 million fighting Horn last Saturday. Pacquiao was able to get a big payday against Horn because he was the WBO welterweight champion, and he’s been fighting regularly. Marquez’s situation is far different. For the most part, he’s not been an active fighter since 2012. Horn vs. Marquez would look like another money grab type of fight. You could compare this fight with Mayweather’s scheduled fight against Conor McGregor on August 26. That’s a fight that has taken intense criticism from the knowledgeable boxing fans. The fans see the fight for what it is – a way for Mayweather and McGregor to get a big payday at the expense of the public. If Horn resorts to the same thing by fighting Marquez, it would look bad. Marquez, if he really wants to fight for a world title against WBO welterweight champion Horn, then he should fight his way to the position rather than having the fight given to him on a silver platter after he beats up on a weak opponent in his tune-up fight in August. You don’t see teams to going to the Super Bowl without having to earn the shot by finishing with a good record and beating some high-quality teams to earn the honor. It cheapens the sport of boxing when you get fighters being given quick world title shots after being out of the ring for years and years. Miguel Cotto hasn’t fought in 2 years since his loss to Saul Canelo Alvarez in November 2015. The World Boxing Organization has installed Cotto as their Number 1 contender at 154, and he’s now fighting Kamegai on August 26 for the WBO’s vacant 154lb title. That’s sad, given that Cotto has been out of the ring for 2 years. You would think that the WBO wouldn’t give Cotto the option to fight for their title due to his inactivity. It’ll be interesting to see how good Marquez looks in August in his comeback fight. Hopefully he’s put in with someone at least a little bit of talent instead of someone that falls over the first time Marquez hits him. I’m guessing that Marquez won’t take any chances of fighting someone good. I think it’ll be a weak opponent that he destroys almost immediately. Marquez is probably not going to get a fight against Horn, even if Pacquiao chooses to retire and not fight Horn again. I see Horn facing someone else from the Top Rank stable like Terence Crawford, Jessie Vargas, Konstantin Ponomarev or Tim Bradley. I think it’ll be one of those 4 Top Rank guys that Horn will fight.